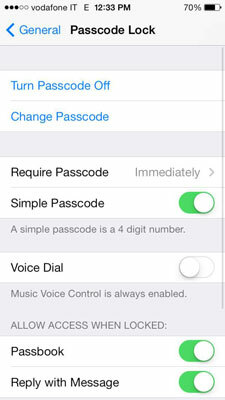 Both iPhone’s Voice Control and Siri (iPhone 4s or later) features are all ears when it comes to using your voice to make your iPhone do things for you — including making phone calls. You can use Voice Control or Siri but not both at the same time, and you need either a cellular data or Wi-Fi Internet connection to use Siri. Speak your command, more or less as if you were talking with a person. You can give simple instructions, like “Call Lucy,” or more complex commands such as “Call my sister at work.” Siri looks for matches in Favorites and Contacts. When a match is found, Siri responds along the lines of “Calling Lucy Blue’s iPhone.” If there is no match or if there’s more than one phone number for the contact you want to call, Siri asks for more information. When there are multiple choices for the phone number, Siri reads the label and the number for the contact, you can then repeat the label or say “the second one” and the call will be put through. 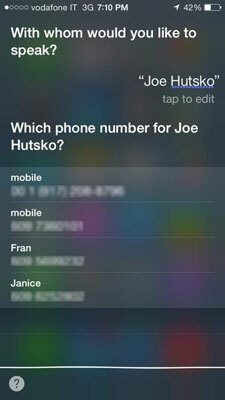 Speak the requested information and Siri makes the phone call when she finds the number. If the person you want to call isn’t in your Contacts or somewhere else on your iPhone, Siri can search the Internet for the number, and then connect you. You get the picture. If the person isn’t available, you can ask Siri to send the person an e-mail or text message. Siri requires a Wi-Fi or cellular Internet connection and can be slow to respond to your request — at times up to 30 seconds — depending on the type of Internet connection you have and because your request is sent to Apple’s server, which processes the request and then instructs Siri how to respond. 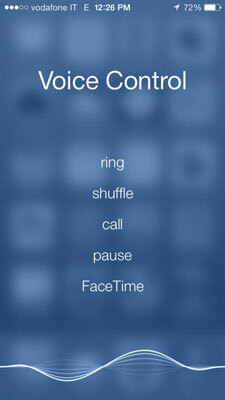 If you use Siri only for making phone calls, Voice Control will probably be faster and more accurate. Press and hold the Home button to activate Voice Control. The screen shown opens (you’ll also hear a double-tone sound). Say “Call” or “Dial,” followed by the name of the person or phone number you want to call. A slightly robotic voice repeats your request aloud and then places your call for you. No Match Found: That’s what the Voice Control robot says (followed by three tone sounds) if it can’t find a phone number in Contacts that matches the name you said; or if it can’t understand the phone number you gave it to dial for you. Either way, you can try again by immediately repeating the name or number (perhaps more slowly this time). Multiple Numbers: If a contact you’re calling has more than one phone number, the Voice Calling robot says the contact’s name aloud, and then rattles off the different phone numbers it finds for that contact, such as “home, mobile, or work.” After listening to the choices, you can repeat the label or say, “the first number” or “the second one,” and your call is placed to the correct number. Multiple Matches Found: That’s what Voice Control tells you if it finds multiple numbers for a name you say, such as “Call Joe;” Voice Control lists the names of contacts with the same name so you can pick one, or it asks you to be more specific. Add relations to your card in Contacts so you can say “Call Dad” or “Call my sister” or to other contact cards, so you can request things like “Call Skip Johnson’s brother” when you have a hard time remembering a name. Sometimes your iPhone has trouble understanding you in a crowded place with a lot of ambient noise such as a party or street corner. If you’re calling an 800 number, you can say “eight hundred,” followed by the rest of the number you are calling. The Voice Control and Siri features work even if your iPhone is locked, which is a handy feature —unless you misplace or lose your iPhone and someone picks it up and starts making international calls.